When Bill Gross, on Thursday, called the huge pile of sovereign debt trading in negative territory a “supernova that will explode one day” on Twitter — people took notice. 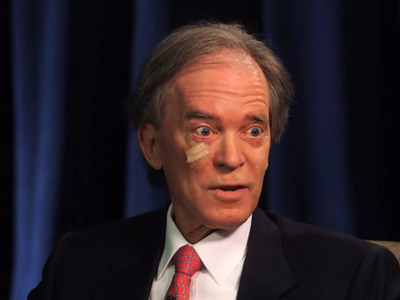 Gross may not be as huge a name as he was when he controlled Pimco’s $270 billion (£187 billion) Total Return Fund, the biggest bond fund in the world, but as probably the most renowned bond investor in the financial sector, when Gross speaks people still listen. 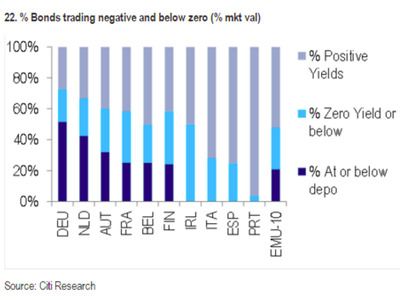 If you’ve been following the markets in recent months, you’ll be well aware that global bonds yields are tumbling, with the German 10-year bund, a benchmark of a safe asset in Europe, seeing its yield at record lows, and close to zero. Yields have fallen so far that more than $10 trillion of government debt worldwide is now trading below zero. To understand what’s going on in the sovereign debt market right now, you need to understand the basic principles of bonds. A bond is like a loan. Someone who needs money — in this case, a government — borrows it by issuing a bond, and if you buy the bond the issuer pays you interest for the privilege of borrowing your cash. The bond will be issued with a specific coupon, say 1%. That doesn’t change. But bonds can be bought and sold a bit like stocks, so their value goes up and down. Yield moves inversely to the price of the bond on the market. The more people want the bond, the higher the prices go, and the lower the yield. Another way of looking at it is how much investors want to be paid to bear the risk of the bond. To use a simple example — say a government issues a £100 bond at a 1% coupon, so it pays £1 a year interest. When financial uncertainty increases, more people want to buy government bonds, pushing the price up to say £200. The bond’s coupon however, is still paying out £1, so the yield has gone from 1% to 0.5% (from £1/£100 to £1/£200). Ultimately this means that in the current climate investors are getting less money back, and in a large number of cases, thanks to negative yields, are now paying governments for the privilege of lending them money. The fall in global yields has intensified in the past month, after a weaker than expected US jobs report killed the short term possibility of the Fed hiking rates, and thanks to a general sense of foreboding in the global economy strengthened. But why are falling global yields a sign so worrying that one of the greatest bond guys of all time felt the need to make such a grim prediction? Basically, the fear in the markets right now is that not only are government bonds costing investors billions globally just to store their money in assets traditionally seen as an incredibly safe way to make a small return, but also that any big, or even medium-sized move higher in yields could spark a huge problem in the market. With so much exposure to government debt, should yields jump, investors could be exposed to seriously heavy losses. For example, Goldman’s widely cited recent report from Goldman Sachs estimated that, should the yield on US Treasuries increase just 1%, it could cost investors as much as $1 trillion dollars in losses. To put that into context, that is more than the entire losses seen in the mortgage-backed bond market, which was the ultimate trigger for the most recent financial crisis. Let us just repeat that so it is clear — If the US Treasury yield moves just 1%, the losses could be greater than one of the most crucial events of the financial crisis. Just let that sink in for a moment. One of the key problems is that as yields continue to fall, investors look to longer and longer-dated debt, which offers better returns. In turn, this pushes prices for that up, and yields lower, creating something of a self-fulfilling loop of buying and decreasing yields. It isn’t however something that has gone unnoticed, with US investor Jeff Gundlach recently calling the negative interest rates imposed by central banks — which are a key driver of negative yields — “the stupidest idea I have ever experienced.” Displeasure with negative interest rate policies is growing worldwide, and this week alone, it has been reported that Commerzbank is considering hoarding money in its own vaults to avoid paying the ECB’s rates. Deutsche Bank said in a scathing note that the ECB’s NIRP is putting the very existence of the eurozone at risk. So while yields still look to be on a downward trajectory, investors are getting increasingly twitchy that something bad could be about to hit the bond market. Hold tight.